Wow, really like the ability to send autoresponders at a later date! I have the need however to have each submission send a reminder automatically about 340 days later. I want jotform to remind submitters that there submittal one year anniversary is approaching and they need to resubmit. Anyway to do that? 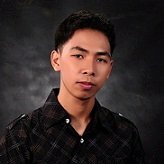 I understand that you want to send the auto-responder after 340 days. Please be noted that the auto-responder can be sent only once after receiving the submission. At the moment, it is supported only up to 30 days or at a later date which is specified from the calendar. Let me forward your request as a feature request to our backend team to see if it can be implemented. We cannot provide you any ETA at the moment. However, if there is any update in this regard, you'll be posted here. Not quite true. I have one form in service which sends an immediate email, a second at 7 days and a third at 14 days. Works like a charm. I just would like to see another option which ideally could be set at a variable number of days. I think now the choices are one day, one week, two weeks a month or on a set date. 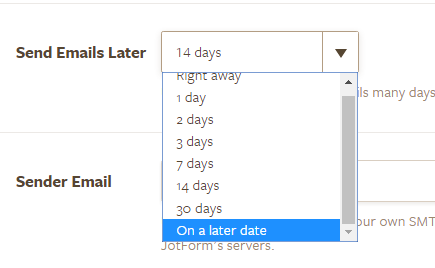 Indeed the current options available for the "Send Emails Later" are at 1, 2, 3, 7, 14, and 30 days max, or at a specified date. We understand that you would like to have more options for days (ex: send email 340 days later), so my colleague has sent a request for this feature to be added. We cannot assure you if or when this feature may be available, but if we have any updates on this request, we shall let you know on this thread.